My oh my how long it seems since I posted my last blog. As always a lot has happened in the past 9 days: and I will do my best to recall everything. Internet has been very spotty here lately, so I'm finally lucky enough to now have the time, and internet to upload some pictures. 5:30 A.M. came quickly. Soon we were loaded up and on the road. We passed through Karatu, Ngoro. Conservaion Area, and up the caldera walls of Ngorongoro. Heading Northwest from NCA we approached Serengeti. Before reaching the park we made a quick detour to Oldupai (commonly mistaken as Olduvai) Gorge, which is a famous archeological site. Lewis and Mary Leaky spent a great amount of time (along with other excavators) in the 1940s, 50s, 60s, and 70s looking for ancient human remains. Such hominids as Homo habilis, Astr. bosei, and Astr. afarensis (more commonly known as Lucy) were all discovered in Oldupai Gorge. It is also nearby to the famous site of Laetoli, where ancient human footprints were found, and dated to over 1 million years old. What else can I say but it was amazing to visit the birthplace of mankind, and think about how far and long it has taken humanoids to reach the Americas. It's been a long time line of evolution and change for all of us (more than 2 million years), but when put on a time line of the earth's history, we are barely a snapshot. I once read that if humans were placed on a time line of the earth, and if that time line was scaled into the length of 1 year, all of human existence would occupy the final two seconds at 11:59 P.M. on New Years Eve. We are still newborns on this planet, it's important to remember this fact. 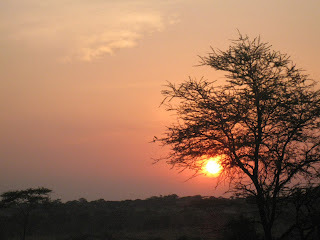 Soon we were back on a very dusty road headed toward the gates of Serengeti. Now I must preface this next statement by saying that I have driven a long ways in my life (I drove over 5,000 miles just this summer), on nice roads, bad roads, off roads, etc......and those of you from E. Washington really understand what I mean. But, the drive into SNP was on the worst road I have ever experienced. It is essentially a washboard for 150 km, and our Jeeps jumbled along painfully. Inside the car it felt like being in a combination of a washing machine and a teeter totter; thrown in every possible direction there was no concern for your belongings or your neighbor. 9 hours after leaving Moyo Hill we entered the plains of the Serengetti. Driving through the southeastern part of the park we took a game drive until we reached our camp site, located essentially in central Serengeti a few km away from the Park Headquarters. What more in life could be better than three full days spent in the Serengeti? 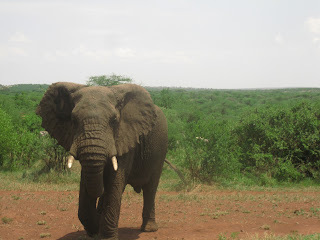 Every day we had a combination of class lectures, game drives, and academic field research. 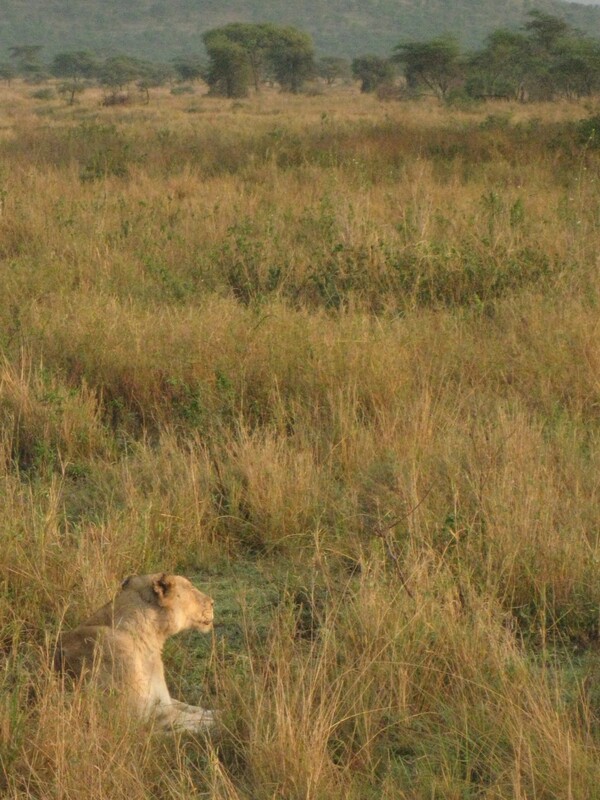 We had two lectures at a research center (where my wildlife management professor Dr. Bernard Kissui did lion research for many years); one on diseases in mammals and another on plant/herbivore interactions. We also had a lecture at a Park Station on Tourism and its effect on the Serengeti ecosystem. One interesting thing I learned is that even in the midst of a severe American recession, tourism is still rocketing upwards in E. Africa and in the N. Tanzanian circuit. I found this impressive, especially when many American tourism operators have been quickly going out of business in the past 5 years. Every day we went out, rain or shine (and trust me it rained). Our first night we went out on an evening game drive, and the next morning we awoke early and left our camp just as the sun was rising over the savanna. What a treat to experience the sun awake and give life and light to the plains of the Serengeti. Something came alive in me this morning. I am inspired and awestruck by the sheer beauty of this place. Animals seen in Serengeti were for the most part similar to everything I have seen thus far; zebra, giraffe, hippo, elephants (I find it funny that I am getting used to watching herds of elephants regularly), cheetah, hyena...a few newcomers to the list were crocodile and a serval cat. We also got to visit a very interesting cultural site called "Gong Rock". It is essentially a huge rock island/outcropping which rises high above the Serengeti Floor. Mwamhanga told us that traditionally, Maasai used to stand and play on the rock to create musical resonances which could be heard many miles away, and was used as a summons. He also stated that Gong Rock is one of the birthplaces of the Maasai belief that God granted them stewardship over all cattle of the world. 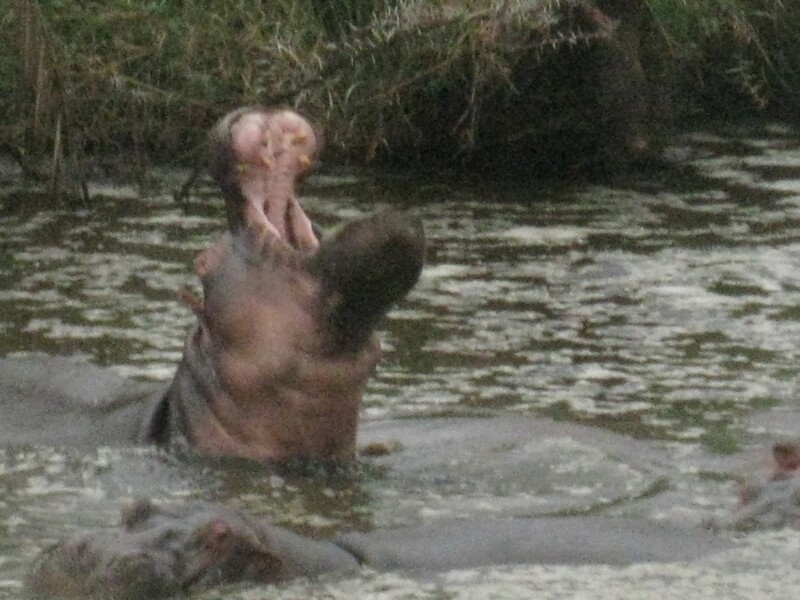 Here are a few highlights from our game drives. Huge Bull Elephant. Submissive Display. Gong Rock. 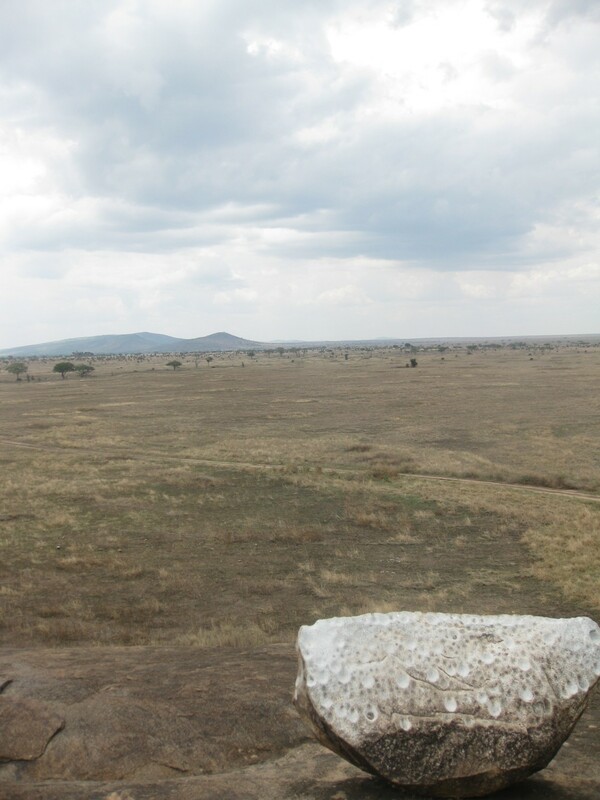 Overlooking Serengeti Plains. We had two research/lab exercises for Wildlife Ecology, one focusing on Bird Species in different habitats, and the other sampling six different antelope species/of the like (zebra, grants gazelle, thomsons gazelle, hartebeest, topi, and reedbuck). I particularly enjoyed the Bird exercise- it was exceptionally challenging. Not knowing any of the bird species or common families in this area it was extremely difficult to identify birds, especially considering the sheer quantity of them! Camp was pretty sweet actually. We stayed away from all of the extravagant tourist lodges and instead pitched our tents next to a small roofed enclosure which became our kictchen. Two of our kitchen staff (arthur and manseuta) came along to help cook meals. The lovable Askari Bura came to protect the camp at night, along with all of our professors, Charles, Wilson (Fuso), and Supaya the excursion coordinator. After class/returning from a safari I would typically quickly grab a cup of Chai (it has become addicting) and listen to the Kiswahili version of BBC with Supaya, Mwamhanga, and Yohanna. Nights were the best around camp. As soon as it gets dark in the Serengeti an elaborate assortment of animals will surely appear. 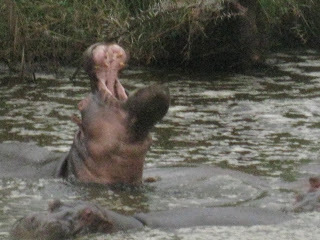 Through our camp alone we had zebra, hippo, hyena, jackal, and lion come through.....kichaa (crazy!) One night a few of us stayed awake late in a car to watch as hyena and jackal came into our camp to sort through our garbage. All the while, Askari Bura tends to a fire to disperse curious predators, and protects the camp with not but a three foot wooden stick (fembo). We were lucky to recruit Askari Elias, who worked for SNP and carried a rifle. Thunderstorms were frequent during our visit; we are coming into the rainy season now, and its shaping up to be a good one. Our first night in camp we were sprinkled on a bit, but mostly watched huge thunderheads from 10-15 miles off cast lightning and rain onto the plains (in Maasai the word "serenget" means land of endless sight) and I remember falling asleep in my tent listening to rain tap at me on our rain fly. On Monday I distinctly remember falling asleep for a peacful afternoon nap, and awaking to absolute chaos. Tent wobbling, rain splattering, girls screaming, "SETH WAKE UP!! WE NEED TO MOVE THE TENT FROM THE RIVER" A torrential downpour appeared and we were quickly sinking. In minutes a river had formed- what once was a dusty and suffocating land became a floodplain, and our tent was directly in the line of fire. Water crashed upon our tent for an hour or two, and all we could do was wait. That night I watched heat lightning fill the air- reminiscent of summers spent in North Dakota (for those of you from NoDak I want to point out that the landscape of the Serengeti is identical to that of southern and eastern ND especially. Hills fall and rise, fields are plenty, trees are sparse, and land meets the skyline decades away from you, I felt completely at home. Woke early to pack up camp and hit the dusty road again. We took a 2 hour game drive heading southeast out of the park, giving me just enough time to appreciate the landscape once again, and say goodbye. 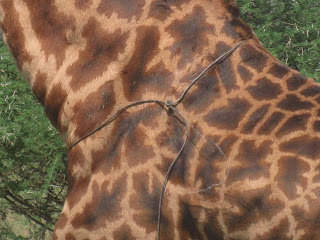 One very interesting thing I saw was a large male adult giraffe which had a wire tangled around its neck, body and legs- poachers. Obviously, hunting and especially poaching is illegal in SNP, but the practice persists because of the economic benefits. This giraffe had been at one time snared by a wire trap either set in the trees or bushes, but was strong enough to break the wire's fibers and escape. In one of our Wildlife Management lecturers we learned all about bush meat harvesting in E. Africa. A new survey released states that only 25% of bush meat harvesting is occurring to meet subsistence needs, most are harvesting these animals as (usually a second) source of income. Animals are continually being killed because of increased human wildlife conflict (lions preying on cattle, etc...), and illegal ivory trade continues to this day (although these days elephants are much less threatened than rhinos). After several more bumpy hours in the car we finally arrived back at Moyo Hill. 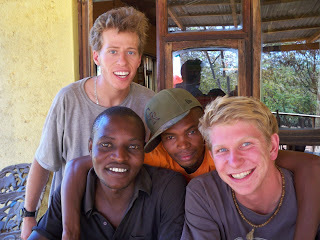 I was excitedly greeted by Safari and Paulo (two of the staff), and we sat, drank chai, and told stories from Serengeti. We have been having an insane problem with jiggers (small fleas which burrow into your skin and lay eggs), and they just sprayed the camp as an attempt to eradicate them. Some students and staff have had up to 15 jiggers, I have been so lucky to only have 10. They burrow very deep into your foot usually, and the only way to get them out is with a needle which is a fairly unpleasant experience. Hopefully the worst is over, but we'll see. Returning to Moyo came with the realization that our time in Tanzania is coming to an end (in 9 days I will be traveling into Kenya) and that we have tons of projects to finish before that time. These days have been mostly spent finishing a bird survey lab, mammal identification sheet, home stay report, an ungulate association lab, and a paper on gender roles in E. African tribes. On Saturday we traveled into Karatu and visited an art gallery/cafe. It was an absolutely necessary break from studying, and an impassable opportunity to sample some African wine and ice cream. In between the chaos of school and traveling, I have taken a few moments to myself to gather my thoughts, and I have put them down on paper as a song; it reflects how I have felt about my 1.5 months in Africa. Here it is, I haven't named it yet...if anyone wants to I would appreciate it. to feed a starving family. I see a burning for peace, love, and happiness. but most importantly, I've learned of love. I know where I can find it again, I know where I can find it again. Now I know I'll come back again. I won't forget that promise I made, I'll see you soon again my friend. Today was a non program day. I traveled with a few other students to the home of Askari Bura and met his family. It was a very long drive about 30km south of Karatu. Bura is one of our guards at the camp and we have become great friends. He knows barely any English, so he has always been happy to practice swahili with me. 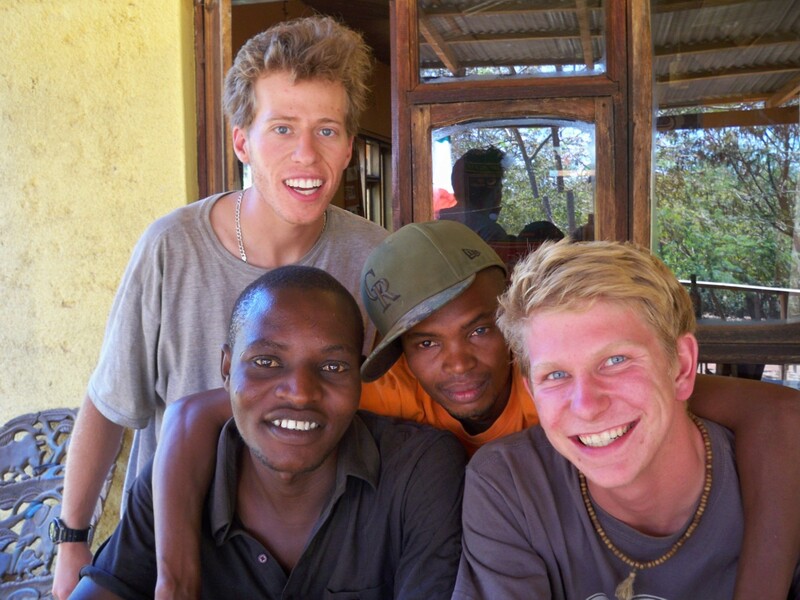 He is a beautiful man who constantly laughs, and finds the most creative ways to connect with American student (usually through teaching songs in Kiswahili or doing his famous animal impressions). We met his wife, mother, and four children. They were an adorable family, and their love for each other was very evident. We sat in their home, they were kind enough to give us soda, and Bura spoke about how he wants to work hard so he can make enough money to build a larger house for his family. He is an amazing family man, and I look up to him immensely.I am really going to miss him when I leave for Kenya, but he has made me promise never to forget him. Afterward we traveled to a place called "Gibbs Farm" in Karatu which has a giant vegetable garden and produces a great amount of coffee. We had a tour of the farm, then relaxed and I sampled their chai and spoke with a carver for a while. I must finish this blog now. With only a few days left here time is short and I have many assignments to finish. Title for your song? How about "African Heart" . Seth! I'm SO happy for you man! sounds like everything is going pretty well, glad to hear it!